* Baroness is a great band, but even greater live than on record. If you found the Savannah, Georgia quartet's latest, 2007's behemoth Red Album, a little too jammy and/or indie-rock oriented, give the band a shot live. They were monstrous at Scion. * A mud-covered, crushed, plastic water bottle, when flying through the air, looks kind of like a bird through peripheral vision. However, when it hits you straight in the eye, it hurts a whole lot. Probably more than getting hit in the eye with a bird would. * Corpsepaint is amazing. So is 1349. They're from Norway and the make a very special kind of musical theater that is as engrossing as it is kind of terrifying. Whoever decided to have them close out the Scion fest was a genius. * Metal fans get a bad rap. Although often defined by their piercings, tattoos or various other parts of their often-gruff exteriors, the crowd at Scion was extremely polite and well behaved. There are more fights/nonsense/jerks at an average dive-bar show than there were all day on Saturday. I'll take metalheads over the typical rock crowd any day of the week. * Mastodon should be packing stadiums with their finely honed racket. Judging by the three new songs they played at Scion, their forthcoming Crack the Skye is going to melt faces. Extra credit awesome: one of the dudes from Neurosis joined them onstage for a couple songs. * This festival should happen again next year! Various press reports have started trickling in over the last couple days. Pitchfork and Paste both posted pretty decent photo sets, but self-titled and Prefix both have pretty excellent round-ups. But we'd like to hear from you. Did you go? What'd you like? Let us know in the comments. I'm really surprised I made it all 12 hours! 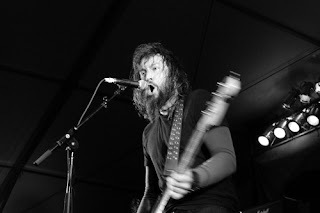 Caught: Kylesa, Salome, Suidakra, Baroness, Harvey Milk, Rwake, Tyr, Neurosis, Mastodon & 1349. Baroness was freaking awesome (I'ma have to order that from you guys) and being within punchin' distance of Rwake for their set was a mind (and ear) blowing experience. Album Cover of the Year 2009! A belated Grammy congrats for Dust-to-Digital!